Jon Rothstein is a real person. He was born in a town at the very outermost edge of what could be called exurban New York City and has covered sports for a living virtually from the moment he graduated from Ithaca College. Rothstein won a Dream Job contest at New York’s ESPN sports radio station, 1050 AM, back in 2004—“he showed a lot of passion, a lot of knowledge,” the station’s program director told the New York Daily News—and in the years since he has written columns and done countless radio hits and television appearances and web videos. He has been at CBS Sports since 2010. Today, Rothstein spends a good portion of the college basketball season on CBS Sports Network, where he is energetic and informed and reliably well-dressed; people who cover college basketball games see him in the press room after the game, always in the front row, always with a thoughtful question for the coaches, and always, one veteran college basketball reporter told me, “in a full suit, with like a pocket square.” The evidence is clear and copious, and it all points to the fact that Jon Rothstein, CBS Sports college basketball analyst, is a real guy. What this story posits is: what if he wasn’t? 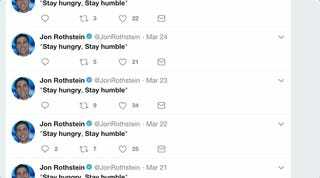 The first thing that Jon Rothstein does on Twitter every morning happens at precisely 7 a.m. Beginning in late June of 2012 and continuing until this very morning, Rothstein tweets the words “Stay hungry, stay humble.” It’s one of a stable of rotating catchphrases that Rothstein uses on Twitter, and is notable mostly because it’s the first one he uses every day. “He doesn’t even have a template or anything,” someone who has worked with Rothstein told me. “I think he types them out every time. I don’t think it’s a scheduled tweet.” More recently, Rothstein has begun tweeting “Every day is a gift” and attributes the quote to a man named “Art Loveley”; that one always goes up at 7:01. During the month of March, whenever a dramatic basketball thing happens or just when the spirit moves him, Rothstein tweets some variation on the words “This Is March.” On March 15, the second day of the tournament, Rothstein tweeted the phrase five different times between 2:10 p.m. and 9:52 p.m. Before the start of the tournament, Rothstein applied for a trademark for the phrase, which would allow him to sell apparel with those words on it; he used the same attorney who helped Bill Raftery trademark “Onions” for use on t-shirts. When Darren Rovell reported Rothstein’s news on Twitter, Rothstein quoted the tweet and appended an additional This Is March to it for emphasis, or out of force of habit, or simply because he couldn’t help himself. But it is also honestly a little strange, if only because of how readily and giddily Rothstein repeats himself. Rodger Sherman noted the “This Is March” thing back in 2015, and if anything Rothstein has used the phrase more frequently in years since. The blog Forget The Protocol pulled together an astonishing taxonomy of Rothstein’s preferred repetitions in 2016. That list ranges from familiar standbys—in addition to the aforementioned, Rothstein has a weakness for the phrase “palpable buzz” and a peculiar tendency to compare Villanova to a Fortune 500 company, which he has done in 15 different tweets since February 1—to an unexpected and lately dormant affinity for Frank Ocean, or at least one particular Frank Ocean quote. There’s no reason to believe that any of this is accidental. Rothstein seems to delight in these catchphrases, although to be fair he seems to delight in everything having to do with his job and his sport and the month of March. I say “seems to” because Rothstein originally agreed, through a CBS media representative, to speak to me for “five to seven” minutes for this story, then declined because he was too busy. At any rate, this is who he is and how he acts on Twitter. That is not what this story is about, though. This story is about the people who have made a sport and a pastime of watching one of the greatest follows and greatest mysteries in college basketball do what he does. We ought to address the profile picture. It is indeed several years old—Rothstein’s hair no longer has quite the same bristly verticality that it did whenever the photo was taken, for one thing—and it radiates a bombastic ardor even before the radial zooms and lens flares come into play. It is both shiny and blurry in some very Older Internet ways; when enlarged it is low-res enough to border on pointillism. Some combination of prankish fan goofery and the perverse rules of attraction that govern Twitter would probably have brought that avi and the account of The College Basketball Guy Who Is Maybe A Robot to people’s attention eventually, but Jim Lohmar, a professor at the College of Charleston and ardent Jonposter, sees that strange and strangely remixable photo as an important part of Jonposting’s appeal. “These nuclear Rothstein photoshops of his Twitter avatar, which itself is hysterical in its coked-up HELLO candor, make Jonposting a satisfying aesthetic experience,” he said. For many Jonposters, though, the image is almost incidental to Rothstein’s oddball appeal. That appeal extends beyond Rothstein’s timeline and into the more abstruse field of ontological forensics. The question, there, is not just what is the deal with Jon Rothstein but whether Rothstein himself is 1) consciously doing a bit or 2) aware that his deal exists at all. Years on, that’s still something of a moving target—“maybe he knows he’s a meme or maybe he’s totally oblivious, it’s so hard to tell” Jonposter Ryan Walsh told me—but the consensus among the Jonposters I talked to is that Rothstein seems, perceptibly if also perhaps by default, to be leaning into his newfound meme-hood. It’s that dance with uncanniness that makes the Twitter version of Rothstein so compelling to observe, if also so strange to behold. Jonposters have their favorite tropes, and the ones they described to me generally had nothing to do with the month of March or how much Villanova is or is not like any of the companies on the Fortune 500. It was the stranger stuff, the recurrences that don’t seem to recur for any identifiable reason. For some it was his jarring tendency to include the actress Minka Kelly in tweets that otherwise have nothing to do with her. For the writer Adam Doster, among others, it was Rothstein’s tendency to recap his objectively gargantuan orders at various steakhouses and Italian restaurants, all of which reliably begin with a house salad. He just puts the same stuff out there, over and over and over again, and then everyone else makes it into something else. It is safe to assume that the original idea behind Twitter was not to create an unprofitable social-networking platform that drives people insane. The original idea, which was also the original idea behind Pop Tarts and Advil and the Scrubbing Bubbles family of household cleaning products, was to create something that would become popular enough to make money. But the ostensible value proposition for Twitter, back when people still believed that such a thing could be said to exist, was that it would bring people together. People were most definitely brought together, and then they more or less immediately began trying to sell each other bogus health supplements and sending each other unsolicited nudes and threatening in credible ways to kidnap each others’ pets. The human capacity to create things has long outstripped the human capacity to actually cope with those creations, and the story of human history is at least in part the story of people trying to figure out how to live with—or at least not die from—all the dumb and dangerous miracles we’ve made. No one on Twitter can really be said to be acting like their best self, or even exactly like their actual self; there is nothing in the system or site as it exists that incentivizes it. People have innately and not-incorrectly understood Twitter as a loud and violent marketplace, and so have gone about selling the version of themselves that they think is likeliest to move units in that space. Of course it is uncanny and stilted and deeply false; the conditioning that conditions that response owes to a series of systems that are deeply and vexingly anti-human. But humans are anti-human as a rule, and humans built this site. It could never have been any other way. Part of what makes Jon Rothstein so compelling as an online meme and character relates back to what makes him successful in real life as a reporter—his earnest passion for the game and the people involved, his avid appreciation for the emotional overage that is the best and most fundamental reason to watch college basketball. But much of what brings Jonposters together in their study is how purely uncanny his clockwork, batshit online persona is—it pushes and pulls between artifice and authenticity in a way that makes it seem somehow both deeply unreal and possessed of some honest and inchoate humanity, and as such it distills what is weirdest about Twitter, and the online experience in general. Here is one veteran college basketball reporter’s best guess at what is going on with Rothstein’s feed: “The initial reasoning behind it was not to create some kind of weirdo bot personality. He was just tweeting this way and noticed how people were responding to it.” And then he just kept doing those things. To a certain extent, this is true of everyone on Twitter.